Between 1850 and 1900, Milwaukee’s rapid population growth also gave rise to high death rates, infectious diseases, crowded housing, filthy streets, inadequate water supplies, and incredible stench. 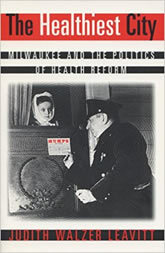 The Healthiest City shows how a coalition of reform groups brought about community education and municipal action to achieve for Milwaukee the title of “the healthiest city” by the 1930s. This highly praised book reminds us that cutting funds and regulations for preserving public health results in inconvenience, illness, and even death.